The Ochi coffee table is a smooth, straight-cut piece of furniture. It’s very simple design is simply stunning and will help you make the most of your reception area’s interior design. 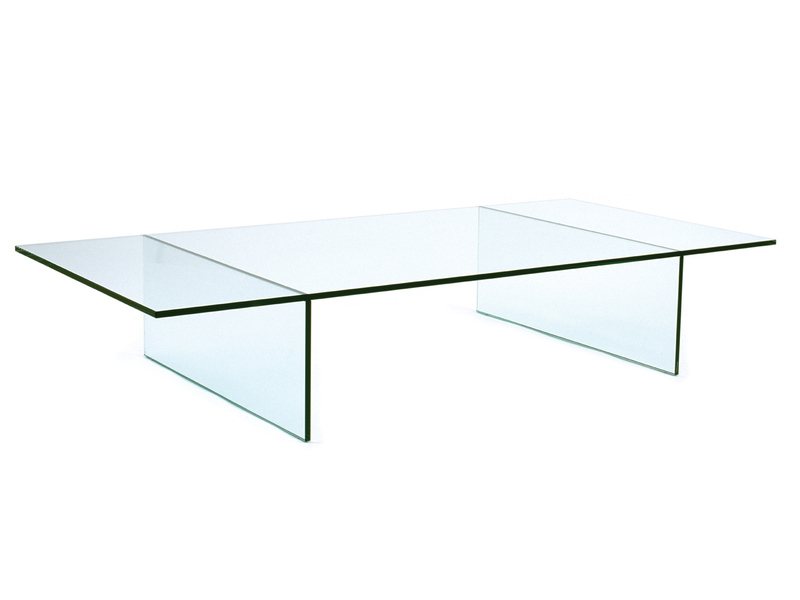 The table is made up of one large piece of toughened glass, which is bonded to two supporting pieces, overhanging on both edges. For displaying your business’s best achievements, and any other decorative ornaments you may own, the Lissi Display unit is perfect. How can a display unit be remotely interesting, you may ask. After all, it’s just some shelves! But that’s not the case, especially not when you have a design as unique as this. 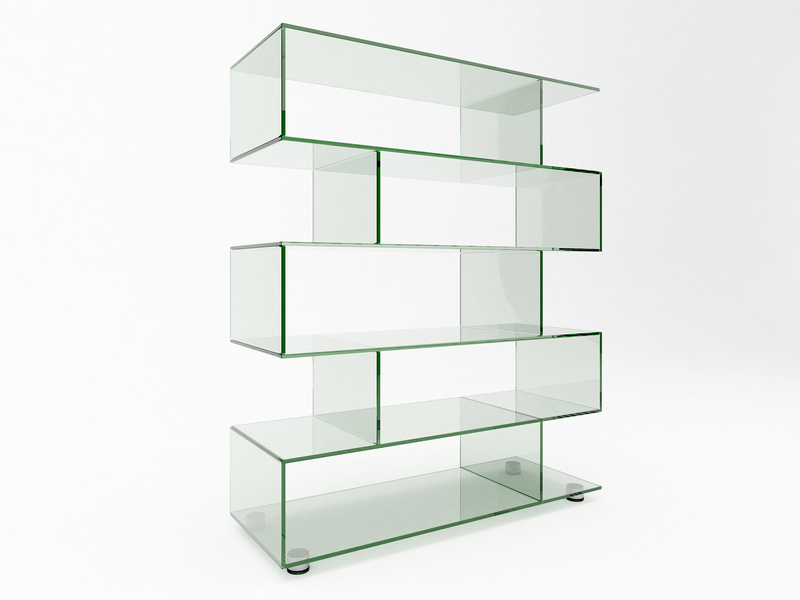 The design gives the Lissi a sort of zig-zag pattern, over five rows of shelving. The Athos Desk is one of the most stylish desks in our range, and one of the most unique looking products we make. 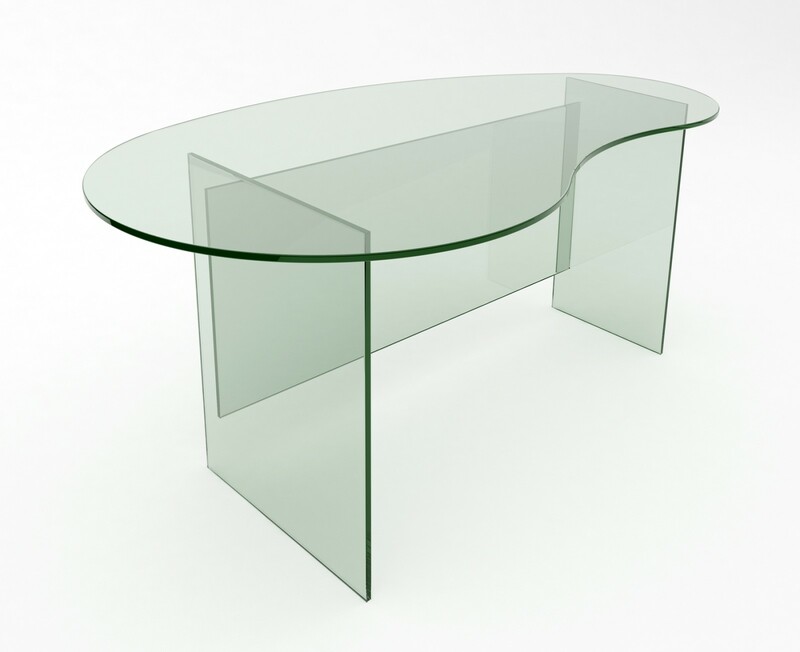 The Athos desk features a base made up of three panes of straight-cut toughened glass. Together, they hold up the main surface pane, which is the show stopping part of the desk. The main pane features is slightly kidney shaped, with its special curves giving the desk a really unique edge. Like the Athos look, but don’t want a new desk? The design is also available as a coffee table. A boardroom table can be the centrepiece of your office, as it’s one of the biggest pieces of furniture around. With it being such a noticeable piece of furniture, the design is key, and that’s why we can heavily recommend the Helicon table. It has a large, stunning piece of round surface glass, bonded to three supporting pieces of glass that intersect to create a great looking criss-cross pattern. With the table being made of glass, it loses the bulky look you can get from boardroom tables, instead creating the illusion of more space. Maybe a glass whiteboard doesn’t quite count as furniture, but all the same, it can be a seriously worthwhile addition to your office. Traditional whiteboards aren’t as satisfactory as they used to be, thanks to advancements in design and technology. A traditional whiteboard stains with shadows left over from previous drawings, with the white surface fading over times. A glass whiteboard is a big step up, with a stunning, sleek design. Best of all, the back of the glass, which is bonded to a unique metal back-plate, can be painted any colour you wish, meaning you have your own bespoke personalised whiteboard, to match the colours of your interior design and branding. Those are just five examples of the Glasslab furniture that could really give your workspace a great boost. If none of those were quite for you and you’re looking for something different, it doesn’t end there. Just browse the categories at the top of our website, to view even more coffee table, shelving, meeting table, boardroom table, desk and whiteboard designs. Or, make use of our bespoke design service to come up with something completely unique. Get in touch now to get a no-obligation quote.